For patients with an often-deadly form of leukemia, lingering cancer-related mutations detected after initial treatment with chemotherapy, are associated with an increased risk of relapse and poor survival. Whole-genome sequencing has been used to determine whether mutations anywhere in the genome, either coding or noncoding regions, detected at presentation were associated with outcomes in patients with acute myeloid leukemia (AML). A team of scientists at Washington University School of Medicine (St. Louis, MO, USA) studied leukemic bone marrow samples obtained at diagnosis from 71 AML patients treated at the Siteman Cancer Center at Barnes-Jewish Hospital and Washington University. Genome sequencing and analysis were performed at the university's McDonnell Genome Institute. For the 71 bone marrow samples obtained at the time of diagnosis and then sequenced, the specific leukemia-related mutations found in each patient's AML cells were no more informative than standard methods for assessing the risk of relapse. The team then conducted genome sequencing on bone marrow samples that had been obtained from 50 patients at the time of diagnosis and again 30 days after the initiation of chemotherapy, when they were in remission. 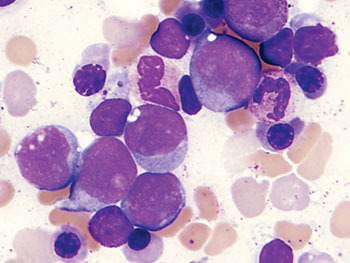 Analyzing these samples, the team found that 24 patients had persistent mutations in bone marrow cells after chemotherapy, even though by standard clinical measures they were in remission. This suggested that at least some leukemia cells had survived the initial therapy. In several cases, these same cells were shown to expand and contribute to relapse. Those with persistent mutations had a median survival of only 10.5 months, compared with 42 months for the 26 patients whose leukemia mutations had been cleared by initial chemotherapy. Jeffery M. Klco, MD, PhD, the lead author of the study said, “If our results are confirmed in larger, prospective studies, genetic profiling after initial chemotherapy could help oncologists predict prognosis early in the course of a patient's leukemia and determine whether that patient has responded to the chemotherapy, without having to wait for the cancer to recur. This approach to genetic profiling, which focuses on performing genome sequencing after a patient's initial treatment, also may be useful for other cancers.” The study was published on August 25, 2015, in the Journal of the American Medical Association (JAMA).